Spring is such a funny season…one day it’s 70 degrees and sunny, and the next it is 40 degrees and raining cats and dogs. This week has been exactly that. And on a cold and rainy day, there is nothing better than a bowl of hot soup in my belly. 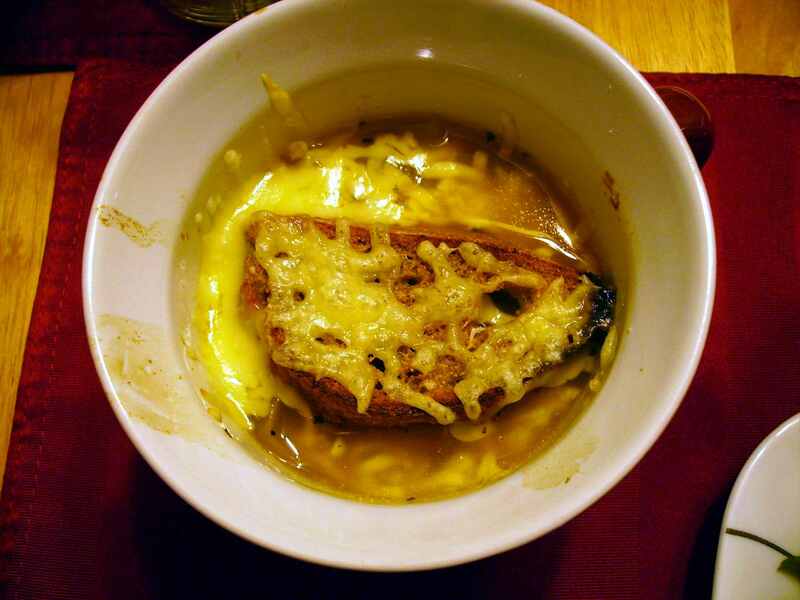 French onion soup has long been one of my favorites; it’s so rich, and the fact that it’s topped with a layer of cheesy bread is just divine. 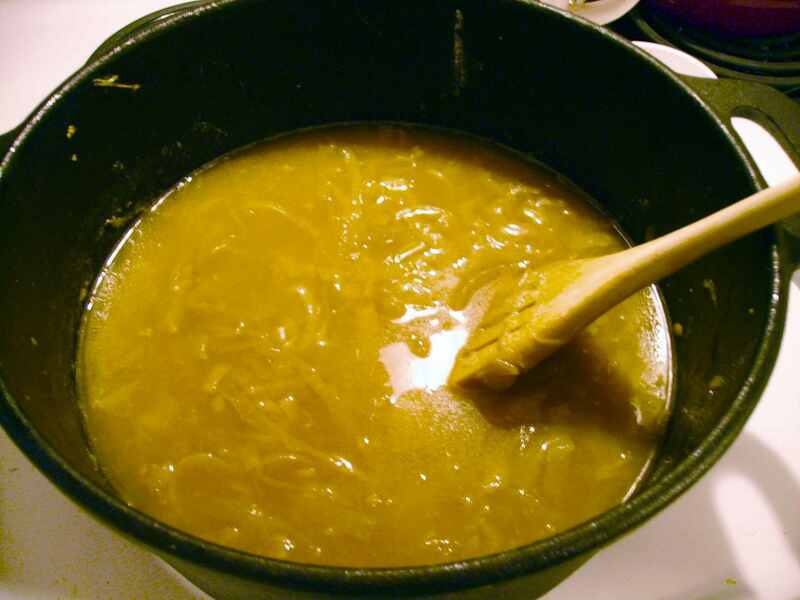 But, I’ve been a vegetarian (well…pescetarian) for about 7 months now, which meant that my old standby recipe for French onion soup was no longer an option. So I set about finding a new recipe that I could serve to friends who were coming over for dinner. A lot of online commentaries mentioned miso as the key ingredient to a vegetarian version of this soup, but since I hate miso, I really wanted to get a recipe that didn’t call for it, since it would probably be better balanced. The one I found, from an old issue of The Vegetarian Times, turned out perfectly! Making this soup does take a long time, so I think of it as a special occasion meal (plus, it serves 6, so it easily accommodates guests). 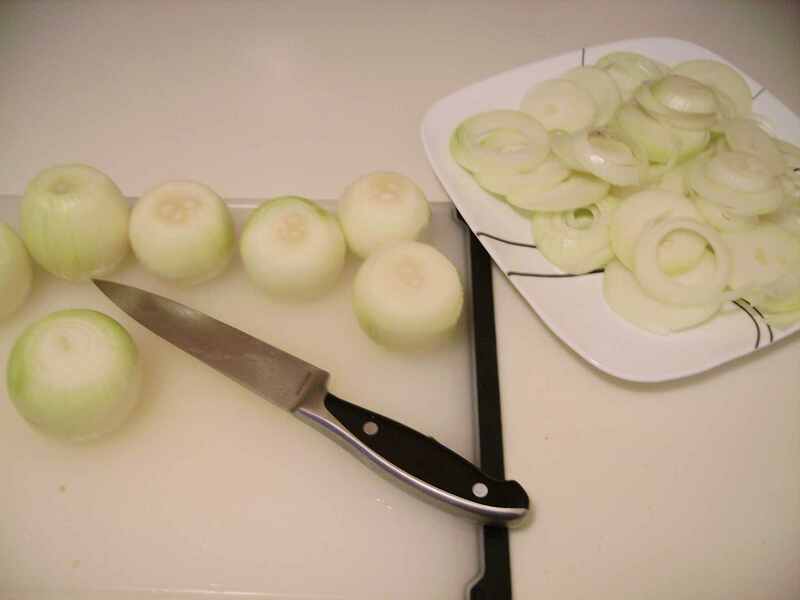 I prefer to use medium-size onions, so there is a lot more chopping involved at the beginning. 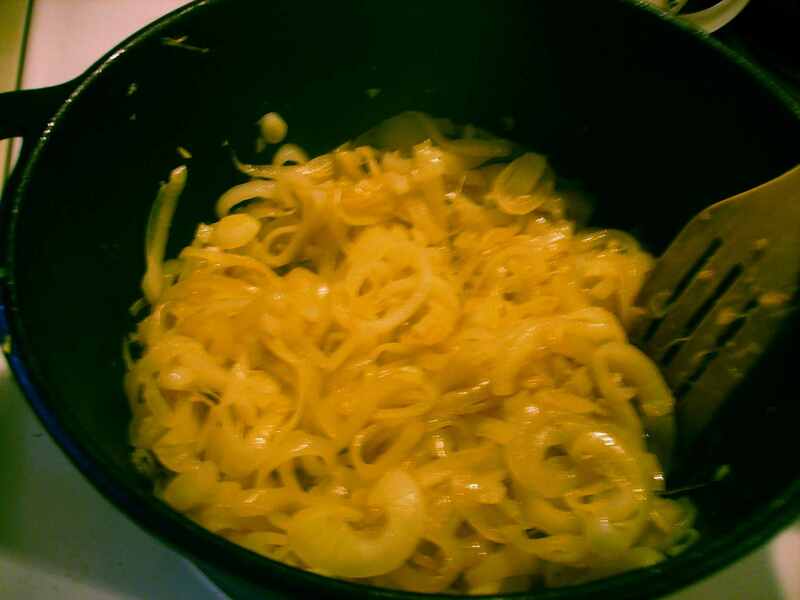 The onions cook very slowly, to bring out the maximum flavor possible. You’re about two-thirds of the way through after you add your stock and let it simmer for 15 minutes. 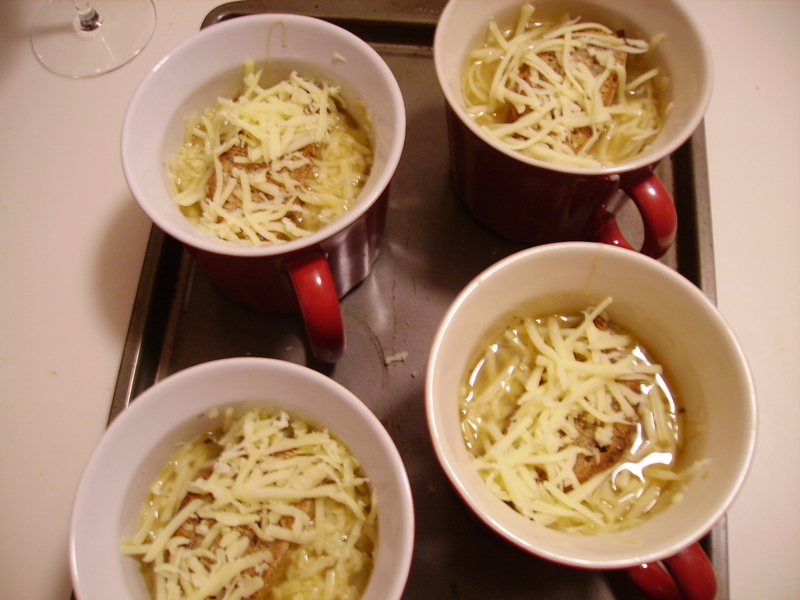 Finally, it’s time to prepare the bowls and put them into the oven to broil until the cheese gets bubbly. I made light wheat baguettes with wheat germ by combining two recipes from Artisan Bread in Five Minutes a Day, a book which every busy cook should have! The bread is soft but hearty with a crunchy crust…and it really doesn’t take any time or effort at all! I topped the soup with Jarlsberg. If you use a healthy bread and just a small amount of cheese, this soup is actually quite healthy. Serve it with a simple salad, and your meal is complete! Heat butter and oil in large cast iron pot over medium heat. Add onions and garlic, and cook 5 minutes, stirring often and breaking up any onion rings that are stuck together. 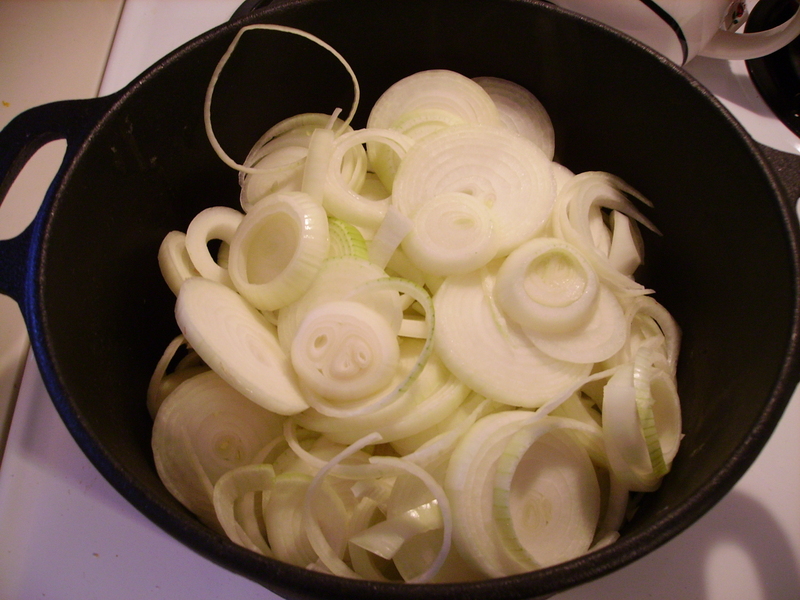 Reduce heat to low and cook, stirring occasionally, 50–60 minutes, until onions are very tender and brown. Stir in flour. Cook 2–3 minutes, stirring constantly. Blend in broth, herbs, sherry, and mustard. Cover, and simmer 15–20 minutes, stirring occasionally. Stir in white wine vinegar. Season with salt and pepper, to taste. Preheat broiler. 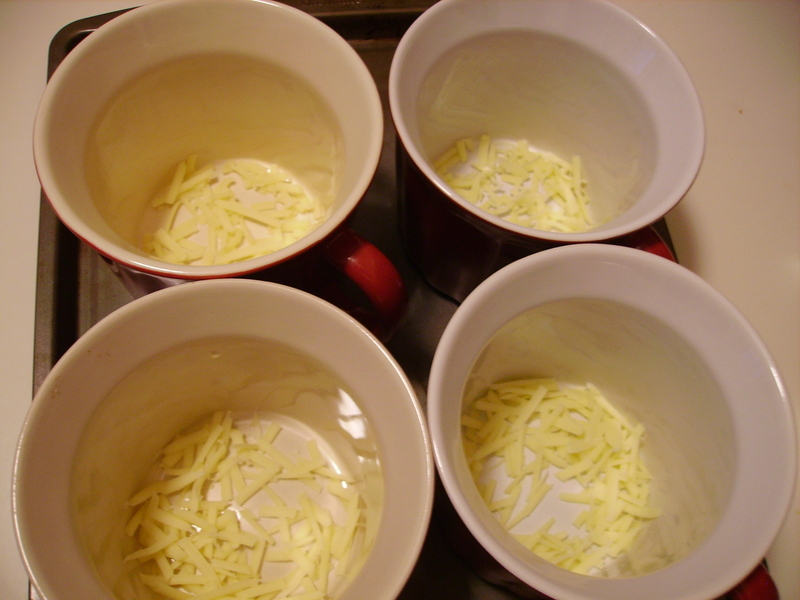 Drop a thin layer of shredded cheese onto the bottom of six heat-proof bowls. Ladle soup over the cheese. Top each with slice of toasted baguette and grated cheese. Broil until cheese is bubbly and golden, about 2–3 minutes. Serve hot. *Note: Fresh thyme, oregano, and sage may be substituted for dried herbs. Made this for SRC today – wonderful recipe, thanks!